Have a question about One Degree Organic products? Curious about how we farm? Want to use our products in your own business? We’ve got your answers. Are all One Degree Organic products plant-based and vegan? All our farmer partners are held to the highest standards of plant-based cultivation and grow crops without the use of chemicals, compounds or animal inputs. One of the key tenets of this high level of agriculture is to reject animal-based fertilizer. The reason for this is to keep pathogens and contaminants away from crops. Our farms use only plant-based fertilizers and favor nature’s own time-tested methods to build nutrients in the soil, such as rotating crop varieties and allowing fields to lie fallow. As a result, they produce healthier, safer food. I noticed a recipe change in one of my favourite products. Why? We always go above and beyond to make sure that we put the very best ingredients in our products. If we make a change to a recipe, it means we have found a different supplier or similar ingredient that allows us to keep delivering this tasty food in our product line for the long haul. My favourite product has been discontinued. How come? This is typically due to a decline in sales. The good news is, we have many amazing sprouted, organic, and non-GMO products for you to enjoy. 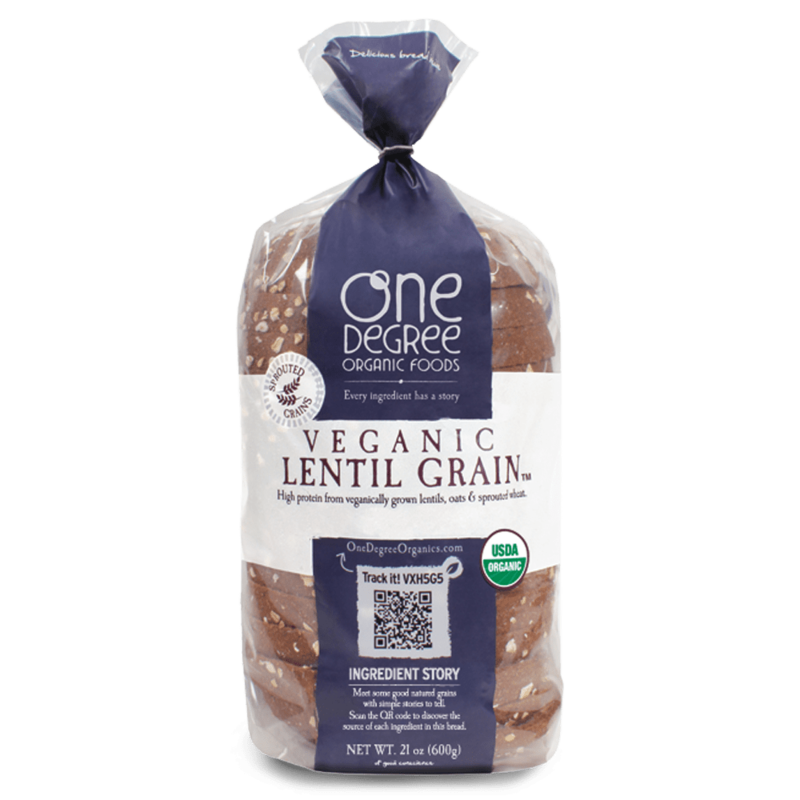 What makes One Degree Organic breads different from other whole grain breads on the market? Our breads are packed with nutrition and every ingredient is organic and grown in a sustainable manner using only plant-based cultivation methods by our passionate farmer partners. Some of the healthy, delicious ingredients you’ll find in our loaves include sunflower seeds, raisins, lentils, oats, flax, spelt, and unrefined salt. Our grains and seeds are also sprouted, so you get more nutrients that are easier to absorb and the bonus of better digestion. What is the shelf life of your bread? Since our breads are completely free of preservatives and shelf extenders, we recommend a 7-day shelf life once bought and up to a 10-day shelf life when kept in your home refrigerator for best freshness. All of your cereals are sprouted. What does that mean? Sprouting is not something we came up with — it’s just a bit of genius we borrowed from Mother Nature. Sprouted grains are grains that are just entering the germination process. These grains release the optimal amount of nutrients and ease the digestion process. This cereal box doesn’t seem very full. How come? Cereals are sold by weight, not volume, so you can count on there being the same amount of cereal in there as when we packed it. Almost all cereals settle within their packaging — just how much is related to the shape and density of the particular flakes, crisps or O’s. Either way, they’re still mighty tasty. 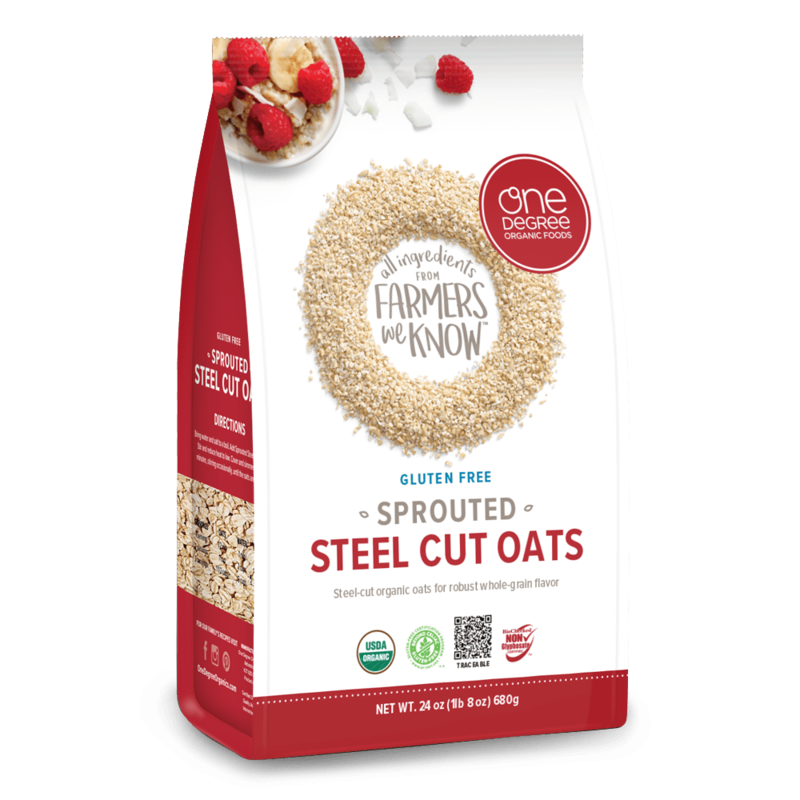 What’s the difference between quick, rolled, and steel-cut oats? Each of these hot cereal types refer to how much the oat groat has been processed and each has its own unique texture and cook time. Quick oats are more finely cut, have a creamy texture, and cook fast for easy breakfasts. Rolled oats are less processed, have a rich taste, and make great additions to recipes (think breading for dinner or cookies for baking). Lastly, steel cut oats are the least processed, have a chewier texture, and add a more robust flavour to your recipes. Nutritionally, they are all the same. 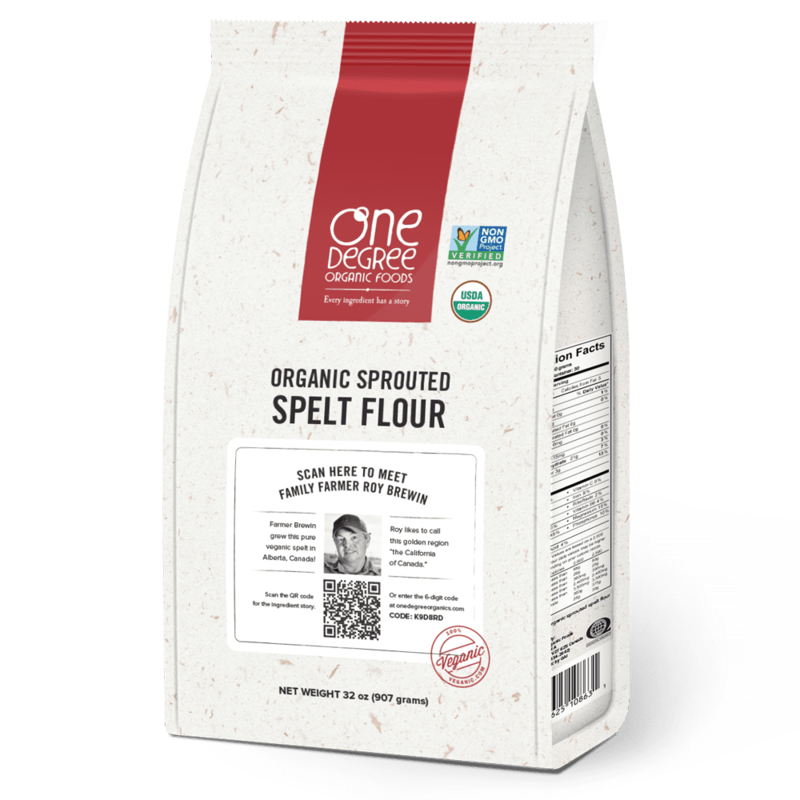 Our sprouted flours are best stored in an airtight container and kept in a cool, dry place. They have a shelf life of up to 1 year. Refrigerating or freezing the flour will keep it fresh longer, especially if you live in a humid climate. What is the shelf life of a package of your tortillas? What kind of gluten-free testing do you do? We take food safety and food allergens very seriously. To that end, we have defined a set of testing protocols for our gluten-free products. Rigorous testing of machinery, individual ingredients and the final product are conducted throughout the production process to ensure our foods comply with government regulations of less than 20 ppm gluten. 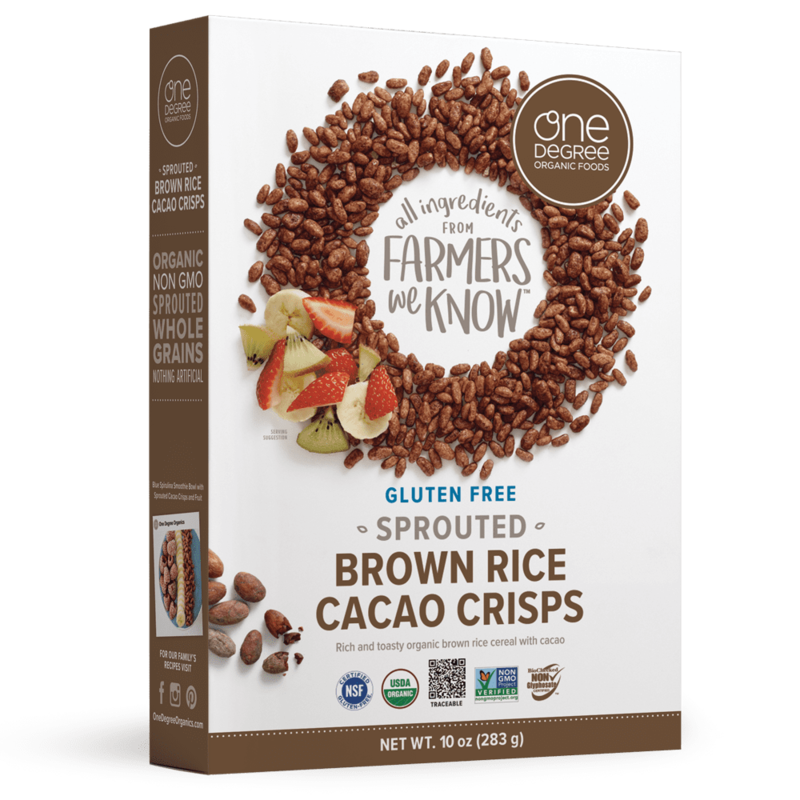 Our Sprouted Brown Rice Crisps, Sprouted Brown Rice Cacao Crisps and Ancient Maize Flakes are all certified gluten free. Our philosophy that there should never be more than one degree of separation between consumers and the sources of their food (hence our name, One Degree Organic Foods). We want you to know where the ingredients you’re eating come from and who grew it, just like a farmer’s market. By scanning the QR code on any of our products with your smartphone or visiting our website, you’ll find a list of ingredients and farmers for your product, plus a video of the actual farm where the grain was grown and an interview with the farmer who planted and harvested the crop. Why are you using cane sugar? We primarily use organic cane sugar to ensure we meet both our high standards for supply-chain traceability and can consistently supply the volume of product we need to keep up with the growth of our business. You can find coconut sugar in two of our boxed cereal varieties, our Sprouted Brown Rice Cacao Crisps, Sprouted Brown Rice Crisps and Ancient Maize Flakes. I’ve heard that harvesting coconut sugar can endanger orangutan populations. Where do you get your coconut sugar? We source our coconut sugar — also known as coconut palm sugar — from Java, Indonesia and there are no Orangutan populations in that area. Also, coconut sugar is sap collected from the flower of the coconut palm, so there is no harm to the coconut tree itself or the surrounding forest. Our farmers have a great respect for nature and their environment. We believe in being transparent and want you to know the full story behind every ingredient we use. Something seems off with my product. What do I do? We are committed to making healthy, high quality food and take the quality of our products very seriously. If you are unsatisfied with your product, please reach out to our customer service department customerservice@onedegreeorganics.com and we will happily work with you to fix the issue. I can’t find One Degree Organic products in my area. Where can I get them? If you want some delicious One Degree Organic Foods products in your area, we would love to work on getting them there for you. Every time we receive a request for product, we share this information with our sales team so they can work on getting them there for you. 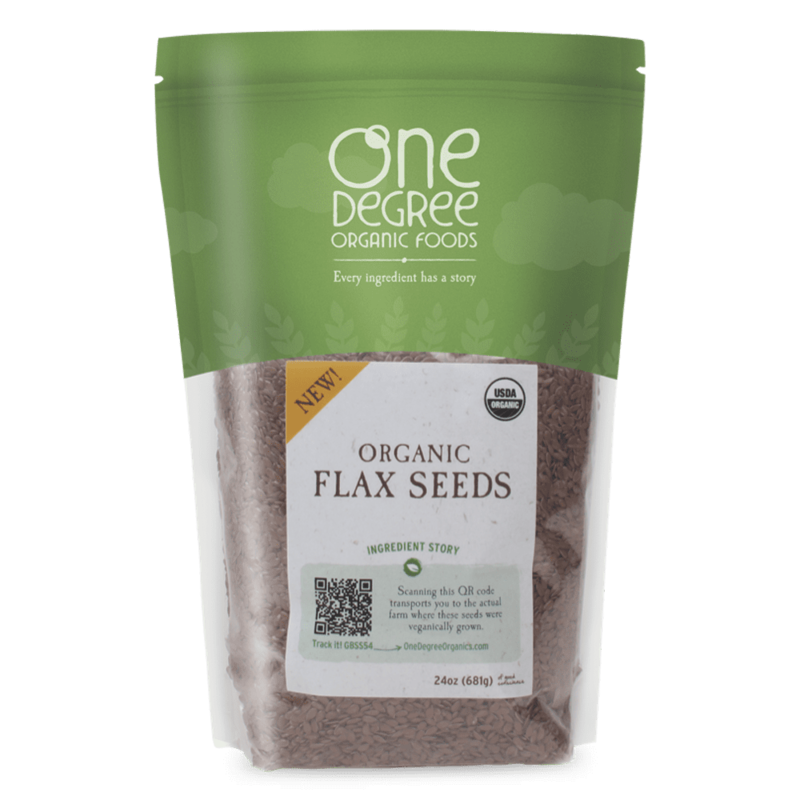 To help speed up the process, please email customerservice@onedegreeorganics.com and we will send back a product information sheet that you can drop off at any of your local stores and request they order in our favorite One Degree foods. Can I buy your products in bulk? We currently do not have bulk options, but you could always ask a local store to order by the case for you and most stores will even give you a wholesale discount! We do not currently sell One Degree Organic products through our website but you can buy them through Well.ca and Vitacost. Since our foods are completely free of preservatives and shelf extenders, and we use cold as our preservative, we rely on distributor partners to get them to grocery stores in the fastest, freshest way possible. Can I buy your products for my food service business? Our products are available through some of our distributors. If you’re interested in being connected with them, please email customerservice@onedegreeorganics.com and we will put you in touch with our sales team. I’m a farmer myself. How can I talk with someone about using my food? If you are organically farming, using plant-based cultivation methods and you think we could benefit from using your product, please email customerservice@onedegreeorganics.com. If you’ve read through our FAQs above and are still scratching your head, submit your question below.